Monkeys terrorize Agra, citizens deploy Langur deterrent! Here’s a piece of wild news: Agra, the city of the Taj Mahal, is being terrorized by hordes of killer monkeys! In the past three months local newspapers have reported at least three incidents where people have been fatally attacked and bitten by monkeys. There’s nothing that the population can do, because these simians are protected by stringent conservation laws. Some residents of Agra have been hiring tamed langurs to protect their women and children from the rhesus monkeys, following a sudden rise in monkey attacks that have so far claimed two lives this week. According to one newspaper, Of the 50 colonies of Agra, people in at least a dozen have hired the langurs, which are bigger and the natural enemies of the rhesus monkeys . A langur can be hired between Rs 200 and Rs 300 a day. The amount includes the hiring charge and food for the langur and its keeper. The precaution, however, failed to save a 58-year-old woman who died on Wednesday after being attacked by monkeys. Bhuran Devi, a resident of the city’s Kagaraul area, was on her way to a local market in the evening when the monkeys suddenly attacked her. She was rushed to hospital where she died of excessive bleeding. Earlier, on November 12, monkeys had swooped on a house in Kachara Thok colony in Runkata on the city’s outskirts and snatched Neha Devi’s 12-day-old son, Arush, from her lap as she breastfed him. The baby’s uncle, Dhirendra Kumar, said the monkeys then leapt to a neighbouring rooftop where they bit the baby’s head. The infant died. “The same group of monkeys attacked a 13-year-old girl after a few minutes,” Kumar added. Last month, monkeys had attacked a 10-year-old, who is still under treatment. Two foreign tourists were attacked in September. Around a fortnight back, the city’s residents decided enough was enough. And that was when the langurs — which are bigger than common monkeys in size and have a louder voice — came into the picture. The snag is that hiring a langur is actually illegal. Even so, residents of the city of the Taj Mahal are left with no option. They decided to hire langurs when the local administration, police and forest officials expressed their inability to do anything against the monkeys, which are protected animals. “We are told that hiring langurs too is prohibited under the Wildlife Act. Even we consider them sacred because they are called Hanuman (the monkey god) but need their help to scare the monkeys off,” said a resident of Rawatpara in the Taj city, 350km west of Lucknow. The langurs are protected animals under the Wildlife Protection Act, 1972, they can’t be owned, traded, bought, sold or hired out and doing so invites punishment under the Indian Penal Code. “There are at least 12 colonies, including Subhas Park, Kamla Nagar and Rawatpara, where we have deployed langurs. Their keepers tie them with a chain and patrol colonies on their bicycles, with the langurs riding pillion,” the Rawatpara resident said. A forest officer in Lucknow said the department had chosen to ignore such transgressions because “monkeys are a real menace in many cities of the state, including Agra, Ayodhya, Vrindavan and Chitrakoot”. “There are over 25,000 monkeys in Agra city and much more in Ayodhya, Vrindavan and Chitrakoot,” the officer added. Back in 2010, the Employees State Insurance Corporation, Kanpur, had hired Mangal Singh, a 10-year-old langur from Lucknow, for Rs 10,000 a month to keep monkeys away from the ESIC campus. In 2009, the railways had hired a trained langur from a zoo to protect passengers from monkeys at Charbagh railway station in Lucknow. 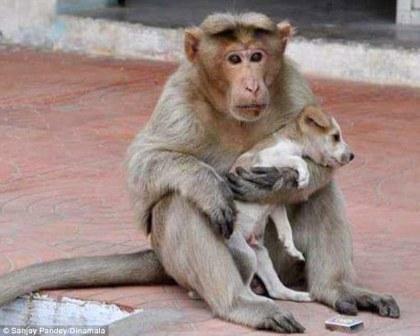 The New Delhi Municipal Corporation (NDMC) has hired 40 young men who can mimic the call of langurs, the natural enemy of the smaller rhesus macaque, to scare away this most common species of monkeys that have been the scourge of Parliament and its adjoining areas.